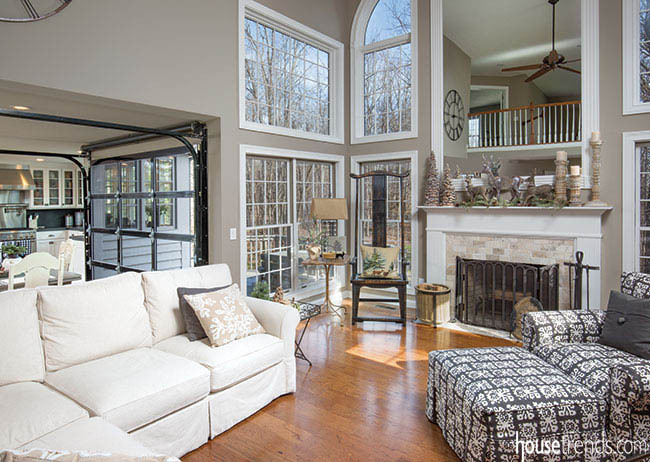 When raised up, this glass garage door offers direct access from the kitchen and dining area to a nearby deck. A kitchen remodel can be inspired by any number of things. It was a nudge from a trusted designer that sparked homeowners Mike and Sandy Rickly’s redesign imagination. 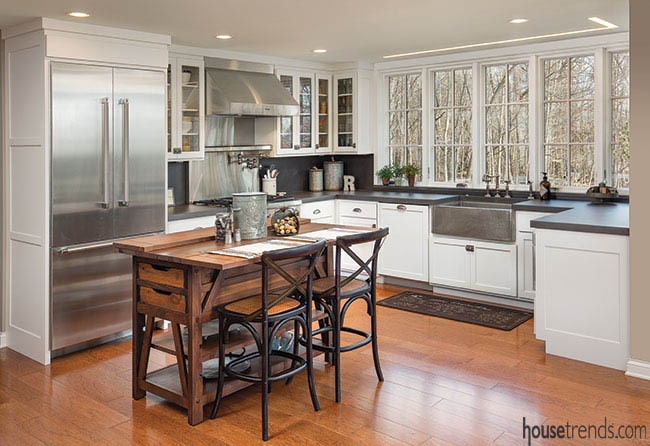 After interior designer Sarah Sullivan worked with the couple on their adjacent great room, she mentioned that it might be time to update the outdated and not tremendously functional kitchen. Seeing her point, the Ricklys contacted Nicholson Builders, who were enthusiastically recommended by several of their friends who had completed projects with the firm. 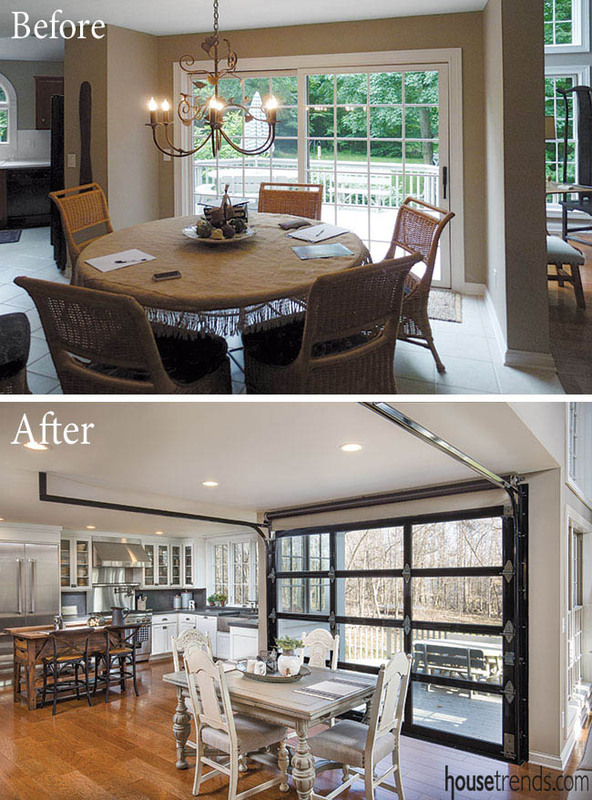 Once the Nicholson Builders design team—including architect John Nicholson, interior designer Annie Scanlon and architect Matt Mutchler—began planning for the remodel, Sandy mentioned that her daughter had been advocating for a garage door that she had seen at a local restaurant and online. Mutchler created multiple renderings to communicate the idea of the garage door. “That was a concept you couldn’t see from a floor plan or elevation,” Scanlon says. 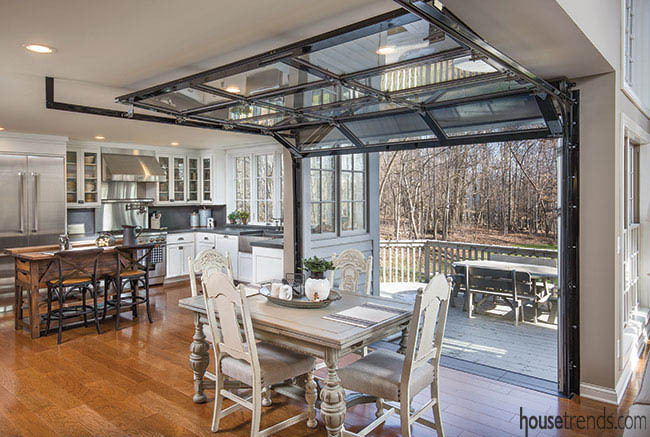 Today, the glass paneled overhead door opens up and lightens their kitchen and eating area, and brings a modern style to their home. 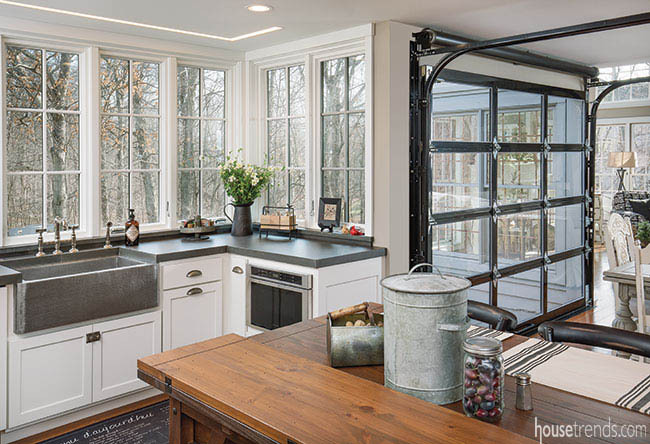 Centered in the eating area between the kitchen and living room, the door made of lightweight aluminum that has been coated in black and inset with clear glass panels sets the industrial style stage. 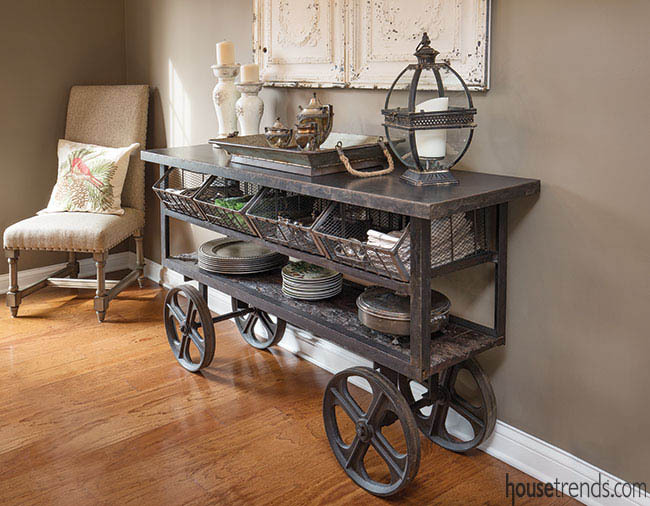 It replaces traditional sliding doors leading to the back deck. Partial walls on either side of the eating area were removed to open the space and make way for the new door. A load-bearing design was necessary for the door’s installation, as was a design to conceal the support system and mechanics—so what is seen would be minimal and elegant. “We still have traditional elements in our house, so we couldn’t go from traditional to super industrial,” explains Sandy. Powder coating the screws and bolts on the door and incorporating slate tile for the threshold underneath were also details designed to help integrate the industrious door. “It’s a good eclectic compromise,” she says. In the original kitchen, a single arched window over the sink, an angled layout with an odd triangular bump out, and partial walls around the eat-in area caused the area to be dark and segmented—as well as a challenge to redesign. “Architecturally, the kitchen didn’t ever really work,” Sandy remembers. Working with John, that all changed. “John brought the vision, expertise and care we needed for this project to succeed,” she says. 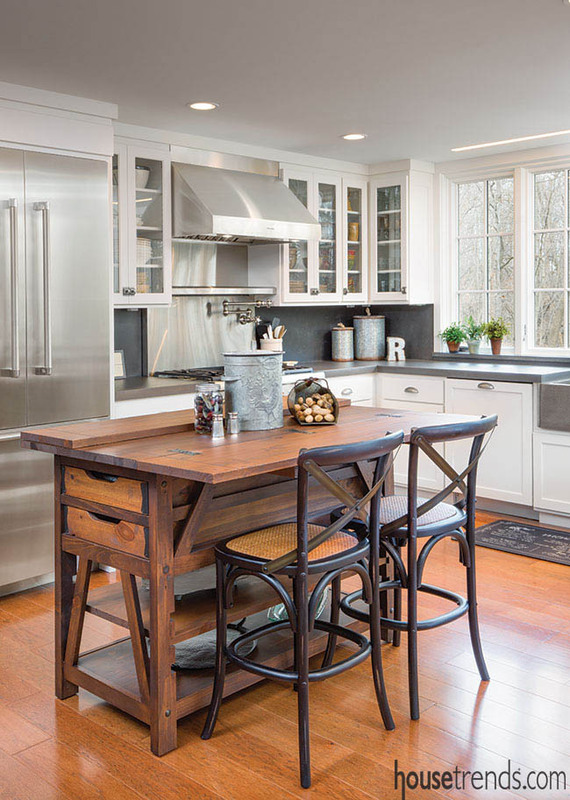 “We wanted to remove awkward angles for a more functional kitchen,” says Scanlon. Reorienting the layout and straightening the back wall; removing the walls to connect spaces; adding a bank of windows; and shoring up the overhead glass garage door were all architectural challenges of the project. The end result showcases a clean design with an open flow bathed in natural light. New windows in the kitchen incorporate minimal headers to maximize natural light and the view of the private wooded back yard. A small number of can lights and a custom linear lighting system flush to the ceiling continue the open feel. “I didn’t want anything hanging down, no pendants,” Sandy explains. 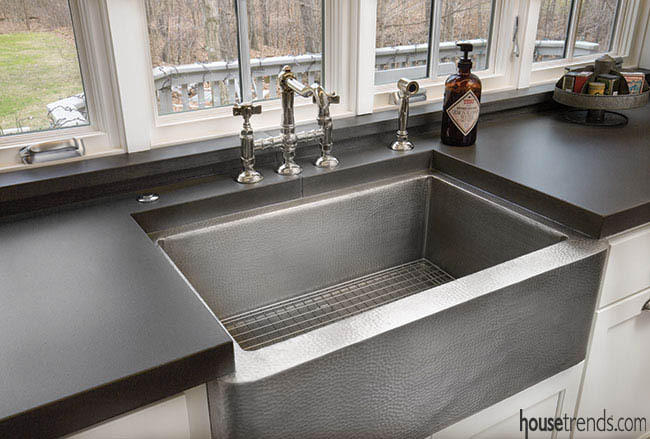 “I didn’t want anything to obstruct the view.” The clean cabinet lines, concrete countertops, stainless steel Thermador appliances, and a hand hammered nickel sink add more sophisticated elements to the modern, industrial style. 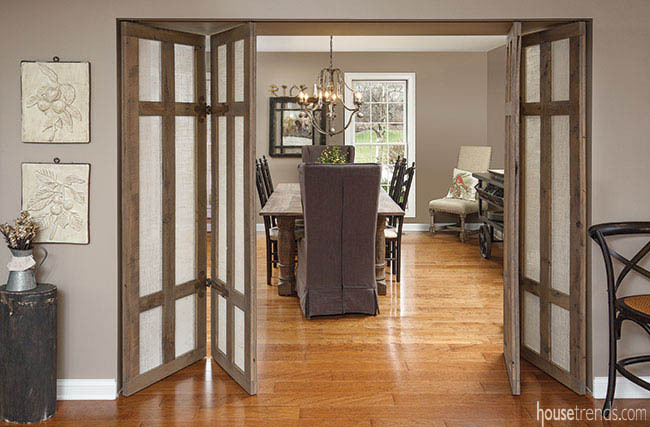 “I went for months not knowing what to do with those dining room doors,” says Sandy. “Annie told me to go to The Reclaimed Barnwood Company in Alexandria.” The result is doors that blend in a bit of a rustic touch and provide a means for privacy from the front of the house. Garage inspiration came to bear in another area of this remodel. An interior wall shared by the kitchen and garage was also reconfigured, this time to add more space to the shallow garage. An avid bike rider, Sandy had been unable to pull her car in with her bike rack on it and close the door. “The garage was short. The goal was to be able to pull the car in with the bike rack on,” she says. 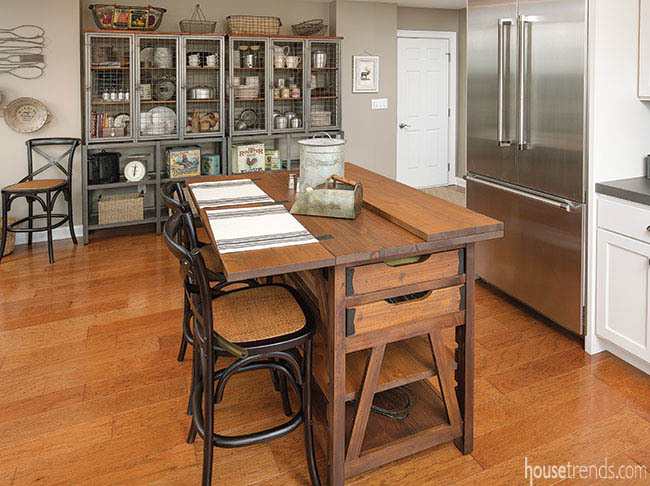 “We needed to move the garage wall.” This alteration meant the loss of a built-in desk and small pantry—neither of which is missed. Metal display units now stand along the kitchen side of the new wall, and on the garage side, Sandy doesn’t have to take her bike off every time she comes home from a ride. The next project Mike and Sandy envision is a screened-in porch off of the kitchen. “We’d like to have a step out area,” Sandy says. “Then we can leave the door up.” In the meantime, with this remodel complete, the Ricklys enjoy their new space and view. “I never walk through my kitchen and not marvel,” Sandy says. And now when she gets home from a bike ride and can close the garage door, she can come inside and open another.